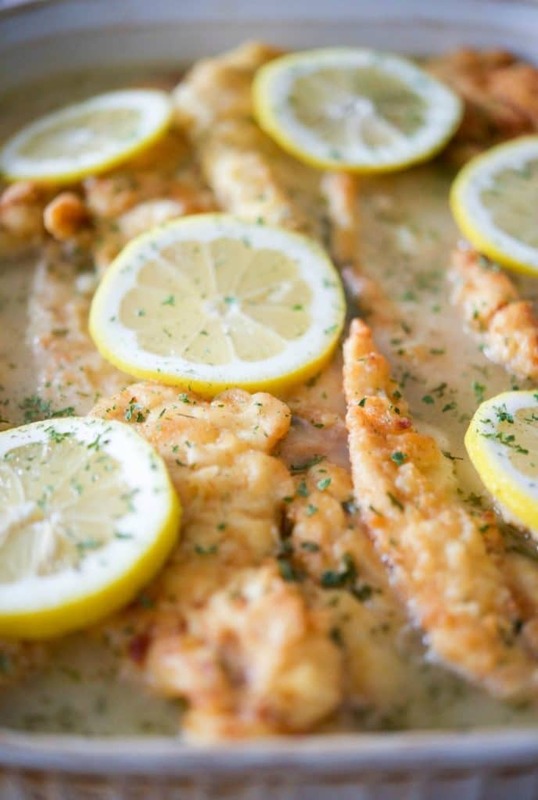 Chicken Francaise made with boneless chicken that’s lightly floured and sauteéd in butter; then topped with a light, lemony sauce. 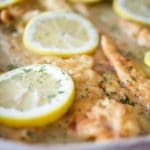 Originally, I shared this recipe for Chicken Francaise five years ago and, like I mentioned a few posts back, I’ve been trying to make some of our old favorite recipes again and give them a photo makeover. I made this recipe in February when my niece and her boyfriend came over for dinner. We don’t get to see them very often, but when we do, she always requests Chicken Francaise so I make sure to have extra in order for her to take some home. 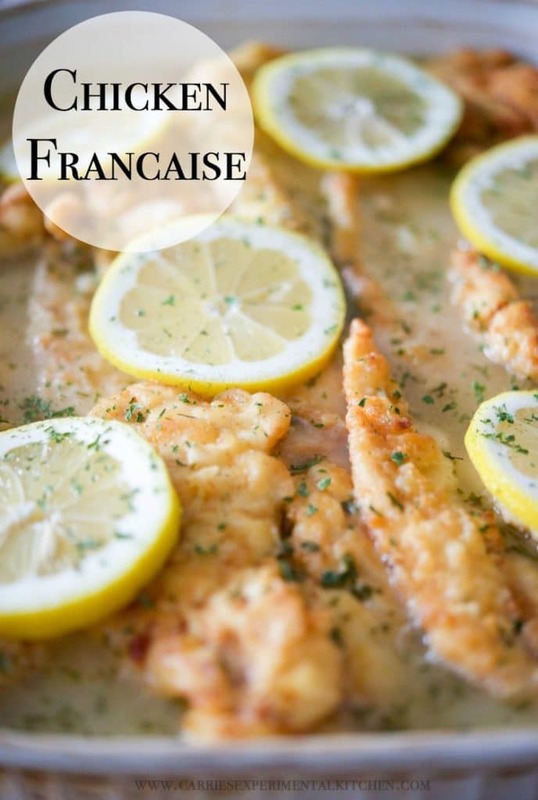 Chicken Francaise is a great meal to make ahead of time, especially when you are having guests. Almost the entire meal can be prepared up to the day before so that you can actually sit and enjoy yourself. Who wants to be stuck in the kitchen the whole time when you have guests? You can choose between two types of chicken when making this dish. 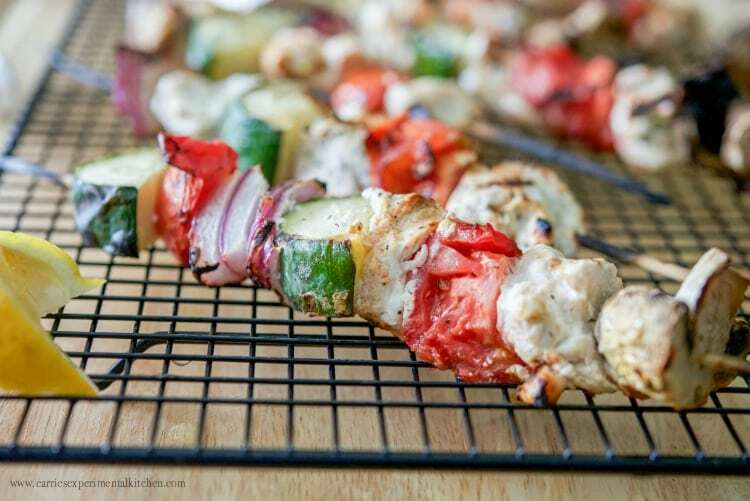 You can use whole boneless chicken breasts (if you are comfortable cutting them down to three or four 1/4-inch pieces by cutting them lengthwise) or you can opt for chicken tenders (the uncooked kind). Which ever option you choose, you must then pound them down slightly with a meat mallet to make them uniform in size and thickness. You will need two separate bowls to coat the chicken. One for the flour; and a second for the egg wash; which is a combination of eggs, lemon juice, milk and parsley. Dip each piece of chicken first into the flour; then into the egg mixture until all pieces are coated. In a large frying pan, melt butter and add oil. Cook chicken 2-3 minutes per side over medium heat until chicken is lightly browned. Place cooked chicken directly into a baking dish and repeat until all of the chicken is cooked through. I like to use a combination of both oil and butter so the butter doesn’t burn at the higher heat during the cooking process. Next, it’s time to make the sauce. In a medium saucepan, melt the butter over medium heat. Add lemon juice, white wine, chicken broth and parsley. Bring the mixture to a boil and stir for approximately 5 minutes; then thicken the sauce with a mixture of cornstarch and water (or flour and water, your preference). 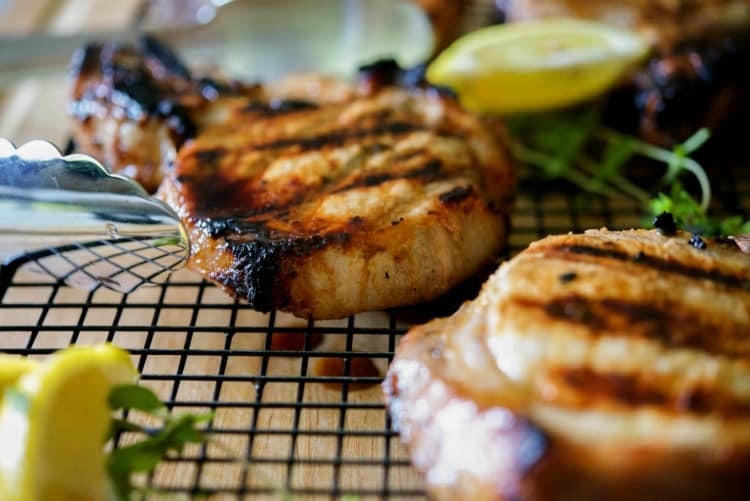 Pour the lemon sauce over your cooked chicken, slice fresh lemons in 1/4″ slices and place on top. Bake at 350°F for 30 minutes until hot and bubbly. 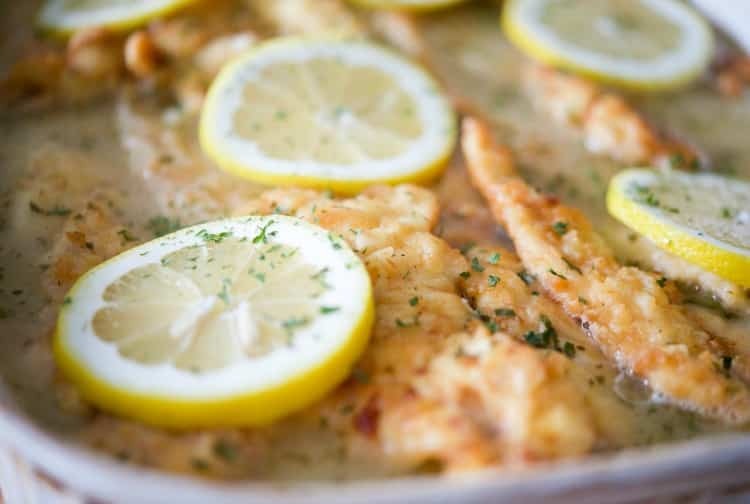 We love this recipe for Chicken Francaise, but it may seem like it’s a little labor intensive as it does contain a few more ingredients than I usually prepare my meals with, but believe it or not, this entire dish can be ready in 1 hour from start to finish. I’ve even made it during the week by preparing everything the night before; then placing it in the oven after I got home for the 30 minutes. I also like to make extra sauce as my family likes to pour it over cooked rice. ~Enjoy! 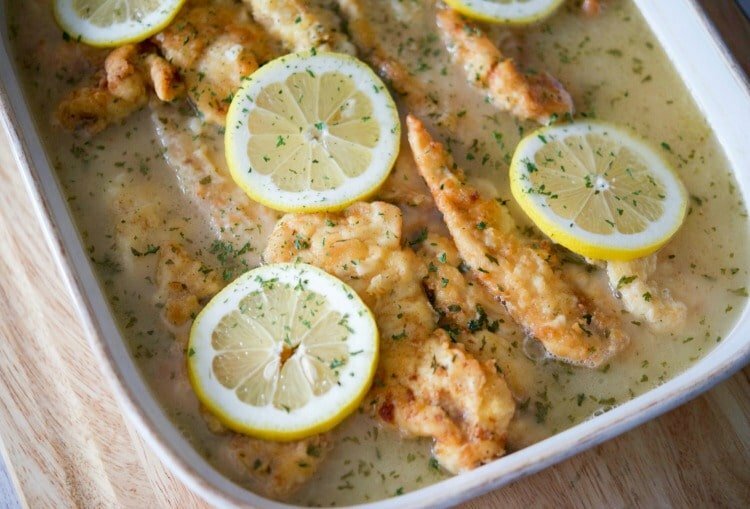 Chicken Francaise; which is tender chicken in a light, lemony sauce, is the perfect meal to feed a crowd. Make extra sauce, it's that good! Dip each piece of chicken first into the flour and then into the egg mixture until all pieces are coated. In a large frying pan, melt butter and oil. Cook chicken 2-3 minutes per side over medium heat until chicken is lightly browned. Place cooked chicken directly in your baking dish and repeat until all of the chicken is cooked through. (If you need to, you can add 2 Tbsp. butter and 1/4 Cup Canola oil if the oil mixture in the pan has been depleted by cooking). Pour the lemon sauce over your cooked chicken. Slice lemons in 1/4" slices and put on top. Bake for 30 minutes. Add 2 3/4 cups of chicken broth (reserving 1/4 cup) and parsley. Bring to a boil and stir for approximately 5 minutes. In a measuring cup, add remaining 1/4 cup of chicken broth and 1 1/2 Tbsp cornstarch and stir together until the cornstarch is dissolved. Add the cornstarch mixture to the saucepan and stir constantly until sauce gets slightly thickened. This sounds amazing! If I made it the night before do you let it sit over night in the fridge with the sauce poured over? Or do you wait to combine sauce before baking? Thank you so much!! Hi Ashley, you can make it the night before with the sauce poured over it. I’ve even made it then put it in the freezer if I was making it for a large party. Enjoy! What kind of white wine did you use? I used a Chardonnay, but any white wine would be fine. 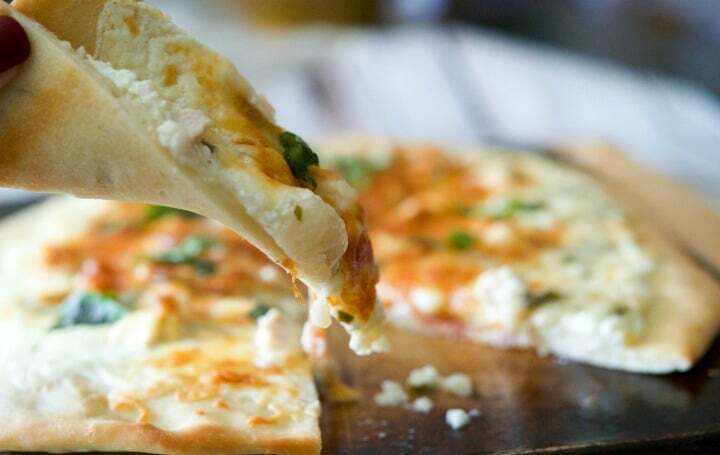 I am excited to make this for dinner! I hope you enjoy it Mary! Hi, did you serve this with pasta? Which type? Thanks. I actually serve this with rice, but any type of pasta would be good too~personal preference! Enjoy! I am wondering if you have ever tried freezing this recipe? Particularly the cooked tenders – then perhaps adding the sauce once thawed? You can do that and I’ve even made the entire recipe including the sauce and froze that too. It helps when making a lot for a party. I just defrosted in the refrigerator and cooked when I was ready to serve. Do you cook it before freezing or just prepare it up to cooking? smells and looks really good! I usually prepare it; then freeze it before cooking. Enjoy! If preparing the day before, do you have to freeze it or can you leave it prepared in the fridge overnight? You can leave it in the refrigerator overnight. Thank you! I did a trial run the other day for my family and it turned out fabulous!!! So tasty! I can’t wait to make this for Christmas! Thank you!!! You’re welcome Natalie I’m so glad everyone enjoyed it! I think this is the first time in years that I’m actually not making this dish for Christmas eve. Merry Christmas to you and your family! I have a question, I want to make this for Christmas and intend on prepping the day before. I will need to have the oven on 400 (for another dish) instead of 350. Would the cook (warming) time be the same at the higher temp? I need to double the recipe. Do you think double the sauce is enough (I don’t want it to dry out at the higher temp) or should I triple the sauce? Thanks in advance! If you double the sauce you should be fine. In essence, the chicken is probably going to be cooked most of the way if not all the way done during the frying process. You can heat up the chicken in the 400 degree oven, but it will take a shorter amount of time. Enjoy! This looks so yummy!!! Just wondering how you divided the 6 chicken breasts. I’ll be serving 10 people and I really don’t like using chicken tenders because of the tendons. If you cut the chicken breasts horizontally you should be able to get 3-4 pieces out of it. I then pound it so that they’re uniform in thickness. Enjoy! I generally use Chardonnay since that’s what I have in the house. The cooking wines tend to be very acidic. When I’m freezing (which I’ve done numerous times), I just fry the cutlets and add the sauce before freezing. Then I defrost and cook and it’s been fine. I wouldn’t use corn starch to thicken the sauce if you’re going to freeze it because it congeals and doesn’t hold the smooth consistency you get with flour and butter. Everyone has their own way of making a recipe, that’s what makes them great by adding your own ideas. I like the actual pieces of garlic in the sauce, but if you don’t, you can certainly cook it; then strain it out. Just wanted to thank you for this recipe! I am in charge of funeral dinners at our church. I was blessed with enough donated money to purchase chicken breasts instead of “whatever was on sale”. I got them home and then panicked slightly because I didn’t know how I would keep 30 servings of breast moist! I searched “chicken breast for a crowd” and found your recipe! I did not take the time to pound the pieces into even thickness but fried the thick pieces first and then placed them in my electric roaster while I prepared the rest and the sauce. The chicken and sauce was in that roaster for a couple hours before the dinner was served and it still received many compliments and thanks! So, I thank you on behalf of the dinner guests! Our church now has a new recipe to add to the arsenal!! If I’m making the night before for a party- can I cook it all the night before and then just heat up the day of the party? What do you suggest is the easiest when having a party? I recommend preparing it with the sauce and all then refrigerate it overnight. Cook it right before you are ready to serve. Enjoy! Thanks! In preparing do you mean breaking and frying it and then just cooking it fully the next day? Yes and you can add the sauce to it too; then bake the next day. (1) Can I make extra sauce on the side day before and refrigerate with pan prepared chicken and just microwave it ( extra sauce only) to warm it up to pour over the chicken after chicken cooked in oven right before guests start arriving? (2 )Also, if I use tenders and pound them thin and prepare the day before serving to crowd (12 women arriving different times) will I lessen my cooking time of 30 minutes? Not sure if pan fried tenders are pretty much cooked and don’t want to dry them out and have mini rubber chickens. (3) Will this stay if women are arriving at different times if I put out in a foil tin over a sturno ? I noticed I only have pinot grigio and flour- should I buy chardonnay and cornstarch? Taking a chance as I am serving this in 24 hours- any help is appreciated. Thank you. 2. Thirty minutes is fine. I’ve made them both ways (using chicken tenderloins and thin chicken breasts and the 30 minutes is just to get the sauce hot and finish off any part of the chicken that didn’t get completely cooked in the pan. If you feel it’s done ahead of time, you can take it out of the oven. 3. I guess my answer would depend on the time frame the women are arriving. The chicken should be fine over a sterno for 1-2 hours. If it’s longer than that, I recommend cooking them in separate pans and spreading out the cooking time. Pinot is fine, I usually use whichever white wine I have opened. you can also use flour instead of cornstarch, but just make sure you get all of the lumps out before adding it to the sauce and only add it a little bit at a time to make sure it doesn’t get too thick. I hope you and your friends enjoy the recipe! Outstanding signature recipe! Thank you. Add capers and you have chicken piccata. 🙂 This recipe sounds delish. I’d probably add a little Dijon to it, also. Going to make it tomorrow for Sunday dinner. Yes you would, I have a recipe for that here too https://www.carriesexperimentalkitchen.com/chicken-piccata/. 🙂 I hope you enjoy the recipe! This meal looks wonderful. It is exactly what I am looking for to make for Christmas. The only problem is I can’t use wine. Can I make the sauce without wine? If so, would I have to add more lemon juice or chicken broth? Thank you. 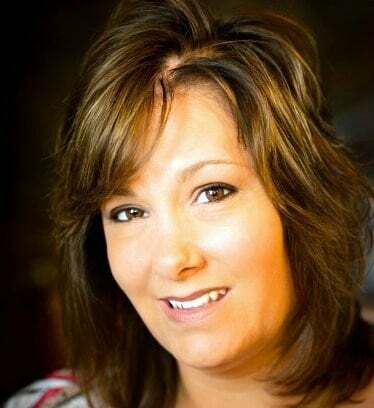 Thanks Janice, it’s one of our favorites around the holidays as well. Yes, you can substitute chicken broth for the wine. I think the lemon juice amount will be fine, but once you taste the sauce, you can always squeeze in a bit more if you like more of a lemony flavor. Enjoy and Merry Christmas! Thank you so much for pointing out my error Eric, I truly appreciate that and it’s been corrected. With over 1000 posts on my site, I’m glad I don’t make that mistake often! (It’s a little bit of a pet peeve of mine!). Happy Holidays! Have made this without adding flour or cornstarch to sauce and liked it. Would like to cook the day before serving but wondered how best to reheat without coating getting soggy? Thanks so much. I’ve made this as is, frozen, defrosted and cooked it without the chicken tasting soggy; however, if you prefer you can fry the chicken and make the sauce separate; then just add the sauce when you’re ready to reheat. The chicken is basically done so cooking the dish isn’t necessarily to make sure it’s cooked through; but rather to infuse the flavor of the lemon sauce with the chicken. I hope this helps. Enjoy!